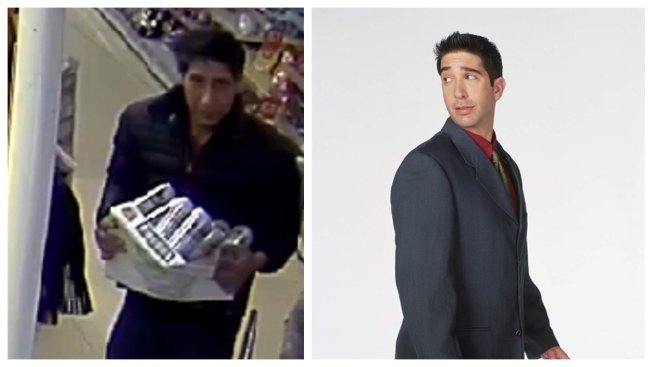 British police say they have arrested a suspect in their hunt for a shoplifter who bears a striking resemblance to Ross Geller, the character played by David Schwimmer on the TV show "Friends." Facebook users noticed the similarity when police posted surveillance-camera footage last month of a man carrying a carton of cans from a restaurant in Blackpool, northwest England. Lancashire Police said Tuesday that a 36-year-old man had been arrested in London on suspicion of theft. The force tweeted: "Thank you for the support, especially @DavidSchwimmer!"